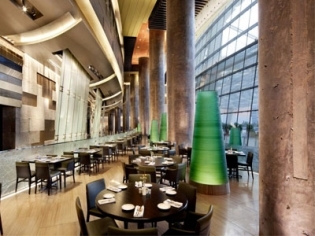 Make a stop at Aria Café and enjoy a relaxed breakfast, lunch or dinner with the stunning view out of the floor-to-ceiling windows. Open from early in the morning until late at night, for anyone needing a late night meal or early breakfast. Traditional breakfast items, sandwiches, salads and soups are complimented by the full bar menu. Make a stop at Aria Café and enjoy a relaxed breakfast, lunch or dinner with the stunning view out of the floor-to-ceiling windows. The garden areas, waterfall and 40 foot ceilings make for a delightful change from the bustle of the dark casino floors nearby! Notice the reclaimed stones on the steps leading to the second level. These stones were part of the famed Boardwalk Hotel which once stood where City Center now sits. Open from early in the morning until late at night, for anyone needing a late night meal or early breakfast. Traditional breakfast items, sandwiches, salads and soups are complimented by the full bar menu. Grab a Bloody Mary before you head back to the gaming tables! Dinner can be as simple as a burger or go all out with a rib-eye or half chicken. The food was great very nice place. Wide variety of food and nice staff. The food was very good, and the atmosphere was great. Lofty and quiet, though it was a little chilly. Definitely recommend it.